With the 6 months of hard work in the gardning business giving way to the 6 months of lazy work, I've decided to get working on the preparation for a new campaign, and decided that this would be the time to get back out a concept I had shelved for later a year ago. Twenty years have passed since the returned SITH LORD Revan has been destroyed for a second time in the Battle of Chandrilla, bringing an end to his seemingly unstoppable invasion of the Galactic Republic. With the death of their master, the surviving Sith forces were driven back into the Outer Rim. 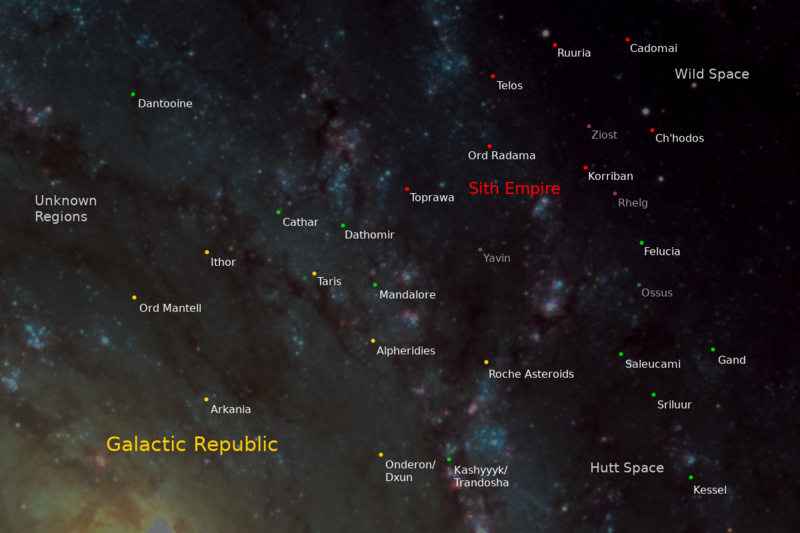 Under the leadership of the mysterious Sith Empress, the SITH EMPIRE has been rebuilding its fleets and recovered its strength, slowly conquering many of the small independent systems of the Rim. Many fear the threat of a new great galactic war on the horizon. In these dangerous times, a small ship carrying a delegation of JEDI KNIGHTS is being attacked by unknown enemies in the skies above the ancient jungles of Onderon. This continuity is based on the Tales of the Jedi and Knights of the Old Republic comics and the videogame Knights of the Old Republic. Revan has defeated Malak at the Star Forge and then wiped out the entire Republic Fleet that was send to help the Jedi Master Vandar Tokare and Jedi Knight Bastila Shan in destroying the Sith threat. Only days later a Sith fleet destroyed much of the Republic bases on Ord Mantell and captured several worlds on the border of Malak's empire. For three years the Sith entrenched themselves in the territory they had taken while Revan disappeared into the Unknown Regions, leaving the Empire and its fortification in the hands of his new apprentice. When he returned with plans for a full scale invasion and conquest of the Republic, his apprentice was not at all happy with simply having the powerful empire she had build from the rubble of Malak's conquests taken away from here and risked in a reckless war. So soon after the invasion began she betrayed him and arrange for his ship to be destroyed in battle against the Republic. For a while the lesser Sith Lords fell into a civil war with each other but in the end Revan's second in command emerged as the new Sith Empress. The Empress is very much aware that her rule and her new Empire are under a great threat from betrayal by the other Sith Lords. Naga Sadow lost his empire in a failed invasion of the Old Republic during the Great Hyperspace War, and his spirit was later killed by his new apprentice Freedon Nadd. The spirit of Freedon Nadd was later killed by his apprentice Exar Kun, who then lost everything in a failed invasion of the Old Republic. Half a century later, Revan tried to invade the Old Republic but was betrayed by his apprentice Malak. Malak wanted to invade the Republic again but was killed by Revan in the Second Sith War. And then Revan wanted to begin another invasion of the Republic but was betrayed and killed by the Empress. For over a thousand years, the history of the Sith has been nothing but Dark Lords being betrayed and disposed by their apprentices and losing whatever empires they established in doomed invasions of the Old Republic. The Empress has vowed to bring an end to this mockery of the great history and traditions of the ancient Sith Empire that ended after the death of the Dark Lord Marka Ragnos. The Empress believes that Marka Ragnos and his countless predecessors that ruled as Dark Lords of the Sith for thousands of years was using the powers of the Dark Side to keep all the other Sith Lords loyal and in line. If her new Sith Empire is to last, she has to rediscover these ancient secrets of the Sith. After having searched the tombs of Marka Ragnos and Ludo Kressh, Naga Sadow's rival contender for the succession of Marka Ragnos, on Korriban without success, the most likely places to discover this power are their great castles on the ancient Sith worlds Ziost and Rhelg. Unfortunately, the exact locations of these systems have been lost. They might have been recoded by the ancient Jedi archivist Odan-Urr and kept in the great Jedi Library on Ossus, but unfortunately Odan-Urr was killed and Ossus destroyed in a supernova by Exar Kun during the Great Sith War. But if some of the archives survived the charring of the planet, and the burned remains of that world could be found hurtling through the emptiness of space, it might hold the key to giving the Empress full control of her Empire. And with that the freedom to focus all her resources and forces on an effort to build a fleet that is actually strong enough to overpower the Republic before it is able to recover its own forces from the great losses of the Mandalorian War and the Second Sith War. While the Empress is searching for the ancient powers to control and gain the unfailing loyalty of the other Sith Lords, she is already working on plans to weaken the military power of the Old Republic, or at the very least hinder its recovery from two devastating war just one generation ago. For that goal, she has made a deal with the Arkanian bio-technology mega-corporation Adascorp. A few years ago, Adascorp researchers discovered a strange fungus on Felucia, that has the ability to kill all nearby plant life and turn it into fertilizer for its own massive and rapid growth. If released into any plant-based ecosystem it could potentially wipe it out completely within a matter of months or even weeks, and it would be just as devastating to any agricultural world supplying the huge amounts of food needed by the Republic. Meanwhile, the Empress has invested huge amounts of resources into attempts to restore the agricultural world Telos 4, that Malak had almost completely destroyed during his reign out of spite. If her Empire is to last, the supplies that Telos 4 could provide would be invaluable. While kidnapped Ithorian scientists are made to work on ways to restore the dead soil of Telos 4 to life, one remote island has been set aside as a test area for Adascorps new biological superwepon. Destroying the farming worlds of the Republic would do the Empress no good when she plans to add them to her growing empire, so she wants to be sure that the methods developed to restore Telos 4 will also be able to restore a world that has been ravaged by the fungus. But the treachery of Adascorp goes much further than simply providing biotech supplies for the Sith and having their own scientists develop weapons for the enemies of the Republic. They also don't trust the Sith to fully keep to their agreement and unknown to the Empire they are adding a safety while they are altering the wild fungus from Felucia to become a more potent weapon. While they are working hard on making the new fungus immune to all known pesticides, they are also ensuring that it will stay highly vulnerable to Opperative White. An old and almost obsolete pesticide that is being manufactured in only one site on the remote agricultural world Dantooine. Which just recently has been purchased by none other than Adascorp. If the Sith are ever trying to cross Adascorp, they will make themselves the saviors of the Republic by announcing the existence of a pesticide that can counter the new Sith superweapon. And make another massive fortune in the process. However, in all of this the Sith made a mistake. Some of the supplies that Adascorp has smuggled from Arkania through the Roche Asteroids and Toprawa to Telos 4 ended up being delivered to the abducted Ithorians working on the restoration of Telos 4. Noticing the unusual amount of Adascorp equipment they are given to work with, one Ithorian managed to smuggle a message to his superiors on Ithor, informing them of a possible link between Adascorp and the Sith. It goes against the Ithorians pacifistic nature to spread accusations against their commerical rivals without hard evidence, but they are willing to spend great amounts of resources and money for the discovery of any kind of proof, if it exists. Away from the Republic and the Empire, in the independent systems near Hutt Space, the syndicate of the Exchange has plans to greatly expand the trade of slaves to both the Sith and the Hutts. They have Trandoshan slavers capture wookiees on Kashyyyk, to be send to Sith construction sites or the Spice Mines of Kessel and the best place to sell them to the Czerka Corporation, that has been driven out from Kashyyyk 20 years ago, would be the planet Saleucami, which is located right on the trade route from the Sith world Toprawa to the Hutt planet Sriluur. Unfortunately, the governent of Saleucami is heavily opposed to slavery and as such all the other involved parties would like to see it gone and replaced with new rulers. 60 years ago, the Great Sith War was started by the Krath, a Dark Side cult from the Deep Core that eventually allied with the Sith and provided great amounts of their military forces in the war against the Republic. (Alongside with the Mandalorians.) With the death of Exar Kun and defeat of the Sith, the remaining Krath leaders fled and scattered throughout the Outer Rim. Some of them found their way to Saleucami and integrated into the local nobility, keeping their powers of the Dark Side a secret. Now that a new Sith Empire is on the rise, they have seen the time arriving for their return to power and are planing to take over the rule of their new home. The Sith see some future potential in the Krath, but as of now they are too insignificant to be considered worthy of any direct support. But being able to have Czerka Corporation provide them with a steady flow of more slaves would certainly be in their favor. The Hutts would also like to see an increased slace trade in the region but are bitter rivals of the Exchange. There are many slavers on Trandosha and if the Exchange were to be taken out of the picture, they are sure they would be able to come to very favorable terms with Czerka Corporation for their services. As I envision the campaign, the players will come across hints leading to all three of these scenarios quite early on on Onderon. Which one they want to focus on will be left open to them and while they do there will be very little progress on the other two fronts. But they might occasionally come across things that are vaguely connected to them going on, like running into archeologist looking for information for the Empress, or Trandoshans transporting wookie slaves. One of these scenarios is about the Sith, the Force, and ancient history, one is about a new superwepon being developed, and one about conspiracies between criminal organizations, nicely covering the three main aspects of what constitutes the whole of Star Wars. They should also be interesting to parties that consist of mostly Jedi, all scoundrels, or anything inbetween. Even the Sith Mysteries scenario can be given an Indina Jones style touch for an all scoundrel party, that probably would have a rather different experience than a Jedi lead group. With it set that old, what sort of weaponry/armor do you see being available during that time>?? I did find stats for all the prominent ship types that appear in the sources I am drawing from. Other than that, I don't see equipment being in any way different from usual. The videogame had swords that can block lightsabers and wearable energy shields that can absorb small amounts of blaster damage, but I don't think I want to use them. They seem like a way to make melee combat a bigger part of the game, but that was never an issue in the comics and the d6 system has always been designed without them. Blasters and armor work the same way they always have, so I am just using them out of the book. "Adventure? Eh... Excitement? Eh... A Jedi does not crave these things."